As I’ve mentioned previously work gave me the go-ahead to attend Web Directions South conference in Sydney at the end of September. Babysitting is pretty much finalised. Dogsitting not organised yet. Conference registration paid for, flights and hotel booked. In an effort to break the ice amongst conference goers Mikons have been created and 35 winners chosen. Mikons are little icons in the form of stickers you can put on your name badges so other conference goers get an immediate idea of what your interests are, eg Mac or Linux, Vegetarian or meat eater, tea or coffee drinker etc etc. I designed one because I could see a great big glaring hole for the new attendees at the conference like I will be. 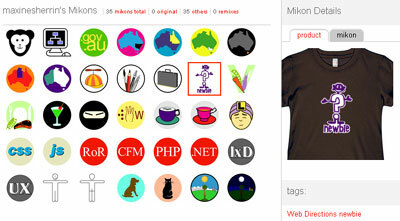 When I say I designed one, I used one of the cartoons available on the Mikons site and added one word to it. But it was selected and immortalised as one that will go on the sticker sheet for all conference attendees. It’s the one shown in the t-shirt below. I even get a t-shirt out of it. So this is one sticker that I will be putting on my name badge for the conference and I’ll hopefully see some others using it too. To meet some other conference goers before the conference I hope to get along to the Port80 meetup the night before. I’ll be the one with the red rose in my buttonhole if I can find the way from my hotel to the meetup place. No I won’t really be wearing a red rose in my buttonhole. Looks good – and good on you for showing initiative – have a wonderful time!